You are playing in a multiple deck game where the option of soft doubling is allowed (which means the vast majority of casinos). 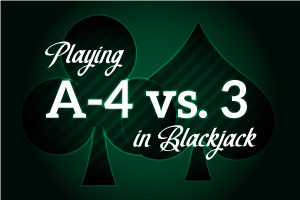 You're dealt an Ace and a four, while the dealer gives himself an upcard of three. Naturally, a signal would go off, identifying a possible doubling situation here. After all, you've got the flexibility of a hand with an Ace, and a dealer upcard that is not necessarily strong. Is that what you should do? Actually, no. The correct play here is not to double this hand, but to hit it. The winning percentages between the two options are similar in that they're close to 50%. But when you examine it further, there indeed IS a difference. When you double down on the hand you will lose 1% more than you win, on the average. If you simply hit this hand, you will actually win 2.5% more, which means you will win 2.5 more hands than you lose, once again on the average. This brings us to a very simple principle; one that should be followed at all times: when you are presented with one option that brings a negative expectation and another that brings a positive expectation, the option to elect is the one which yields POSITIVE results. The negative yield makes it impractical to double here. Take the opportunity, through the flexibility the Ace provides, to take as many cards as you need in order to put together a winning hand.